America, 1876. Tom Olam has finally returned to the land of his birth, and finds it very... Falkensteinian. The United States is run from behind the scenes by the Freemasons; Voudon haunts the Orleans Free State; Sam Houston is on his seventh term as President of the Republic of Texas; the Great Plains is home to the Indian Twenty nations confederation; and the Bear Flag Empire of California is ruled over by the highly eccentric Emperor Norton I. From there, things get weird. This is the comprehensive sourcebook for North America in the world of Castle Falkenstein. Complete histories and social details are provided for the nations of America, along with new Dramatic Personas, new Abilities, new magick, new steamtech,and a Gunslinging Dueling system. 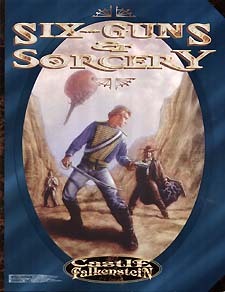 Plus, a uniquely American Sorcerous Order - the Spellslingers! Lavishly Illustrated, this is one Castle Falkenstein saga you can't do without!